This morning during meditation instruction, somebody who helps with the instruction, talked about his journey into Buddhism. Some years ago his younger brother had said “Buddhism points the way” and, “it’s up to you to find what the Buddha found”. The first teaching the Buddha gave after he realized enlightenment was the Four Noble Truths. “I already knew about the first two” he said; unsatisfactoryness (dukkha), and craving (tanha) which is its cause. “And the other two I didn’t know about, however I took them on faith until I prove them true for myself”. For him that ‘s what made Buddhism a religion, the faith bit. He took it on faith there is an end to unsatisfactoryness – the third Truth and there is a proven path – The Eightfold Path – the forth Truth. I inherited my questioning nature from my father. He was a deeply spiritual person, who felt no need to be attached to a faith tradition although he’d say, if he were to be anything, he’d be a Buddhist. In his latter years, when I’d become a priest, he spoke a few times of his inner life. Relating his evolving understanding into the nature of existence, that had begun as a young boy. He was matter of fact when he spoke of these profound matters, and they were profound, some being outside of my personal experience at the time. Through out his life he’d felt no need to label his experiences and there was not a sign of a person burdened by understanding. Some people blossom within a faith tradition and some, like my father, grow and flourish like a tree in a forest. Who is to say which is best? In 1980 during our drive to Heathrow, on route to Shasta Abbey to become a monk, I felt the need to explain myself to my dad. 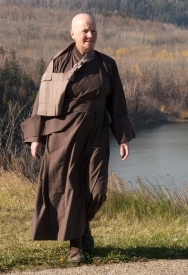 “Err, I am going to be a monk to find out that I don’t need to be one”. It was half an apology to him and half an explanation for myself. At the time I knew nothing of his inner life only his attitude towards ‘organized religion’. He and my mother supported me in my decision as, in my early thirties, I was free to make my choices and they respected that. If my father were still alive I’d let him know, “I didn’t need to become a monk, however I’m glad that I did”. The practice has changed my life for the better. Recently there have been a number of younger people who have received meditation instruction and returned here to the priory to meditate. One such person came this evening, another tree that has been growing in the forest, and doing just fine. I’m at once encouraged that such individuals have found the door and walked through and concerned that in some subtle way they will become hindered by a hope of, or desire for, a journeys end. Paths, after all, imply they lead somewhere. Perhaps, like me, they will eventually realize they didn’t need to walk through this particular door and at the same time, be glad they did. Trees grow and flowers blossom within a Great Benevolence not bound by time or place. I hope and pray I’ll not get in their way as they shoot up past me. Moving Mountains provides a window on one particular Zen Buddhist monk’s daily life practice, and that is all it is. If reading it points the way and encourages you to keep following your path, whether or not it is part of a faith tradition, then that is good. However, voyeurs beware; you might find yourself pulled through the window in spite of yourselves! This posting is offered in loving memory of my father, Tony White, who died 29th January 2000. His remains are buried beside my mothers in the grounds of Throssel Hole Buddhist Abbey. They both requested Buddhist funerals which I conducted. We are made of carbon, hydrogen, oxygen, some sulphur, a dash of phosphorus and traces of odd metals. Literally we are formed from stars that died and exploded, and we re-enter that cycle on death. For a brief moment we are ordered, process information, and defy the second law of thermodynamics. That time is precious and I don’t think the labels matter too much. Merton was a Trappist, Meister Eckhart was a Dominican. As you told me, “train as though your hair is on fire”. You were deadly serious, it’s not a game, intellectual or otherwise. It can be frightening and dangerous. Six years ago…..hmm time does pass swiftly. I remember him coming to our farm and bringing some beautiful, homemade jam and starting my passion for jam making.